Enjoying a fabulous location, overlooking Ayios Yiannis beach on the beautiful island of Chios, Monolia Maisonettes are five individual self-catering holiday homes, offering luxurious accommodation with fabulous sea views. Standing by a secluded beach on the east coast of this fascinating island, Monolia Maisonettes are within easy reach of many of the most important landmarks on Chios, including the castle, Nea Moni Monastery, the deserted village of Anavatos, Mesta, Pyrgi, with its uniquely decorated houses, and much more. Activities available close by include mountain biking and hiking, scuba diving and snorkelling, windsurfing and rock climbing. Manolia Maisonettes feature elegant, modern design, and are spacious, light and airy. Fully equipped with everything necessary for relaxing stays, they are air-conditioned, come with a fully equipped kitchen, and complimentary Wi-Fi. This east-facing maisonette is decorated in a vibrant blue. It has two private balconies, one on each floor, both with endless views of the sea. On the upper floor, there is a dining and sitting area and a fully-equipped kitchen with fridge, oven, Tassimo espresso machine and Corian® solid surfaces. One large double bed, one sofa-bed. Maisonette size 60 sq m.
Featuring elegant decoration in blue tones, Maistrali has two private terraces, one on the ground floor and one on the upper floor. 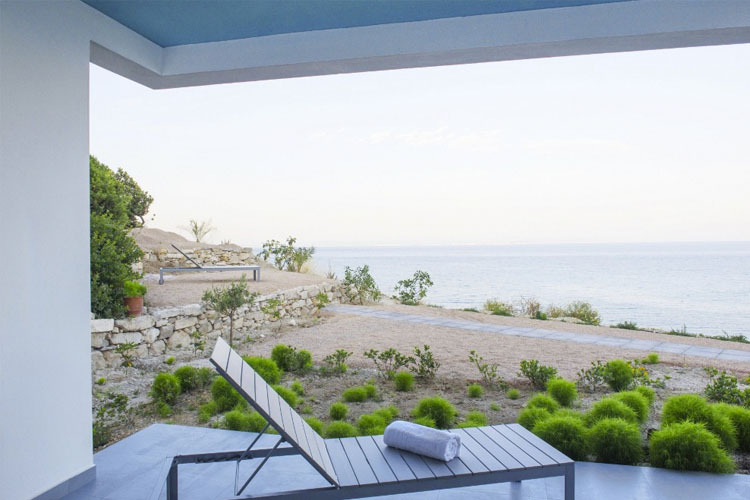 They both enjoy unlimited sea views, overlooking the picturesque fishing village of Kataraktis. On the upper floor there is a dining and sitting area and a fully-equipped kitchen with fridge, oven, Tassimo espresso machine and Corian® solid surfaces. One large double bed, one sofa-bed. Maisonette size 60 sq m.
Meltemi maisonette is a self-catering apartment with one bedroom and a quality sofa bed in the lounge area. It has two private terraces, on the ground floor and the upper floor, both with amazing sea views. On the upper floor there is a dining and sitting area and a fully-equipped kitchen with fridge, oven, Tassimo espresso machine and Corian® solid surfaces. Towels and slippers are from COCO-MAT. One double bed or twin beds, one sofa bed. Maisonette size 60 sq m.
Ostria's vibrant yellow décor is in line with the strong light of the Greek summer. It has two private balconies, one on the ground floor and one on the upper floor. They both enjoy unlimited sea views, overlooking the picturesque fishing village of Kataraktis. On the upper floor there is a dining and sitting area and a fully-equipped kitchen with fridge, oven, Tassimo espresso machine and Corian® solid surfaces. There is also a fireplace which can be lit upon request. One large double bed, one sofa-bed. Maisonette size 60 sq m.
Tramontana's main colour is the blue of the sea, just like the sea-horizon view guests can enjoy from its balconies. Tramontana has two private balconies, one on each floor. 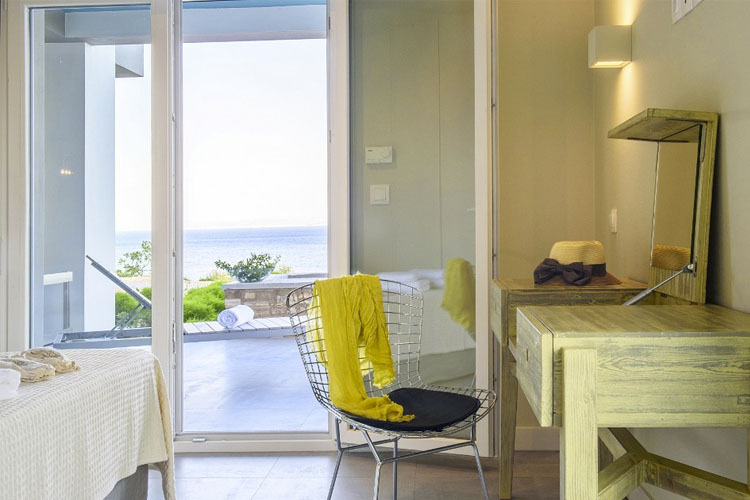 They both enjoy unlimited sea views, overlooking Ayios Yiannis, the quiet beach right below the property. On the upper floor there is a dining and sitting area and a fully-equipped kitchen with fridge, oven, Tassimo espresso machine and Corian® solid surfaces. One large double bed, one sofa-bed. 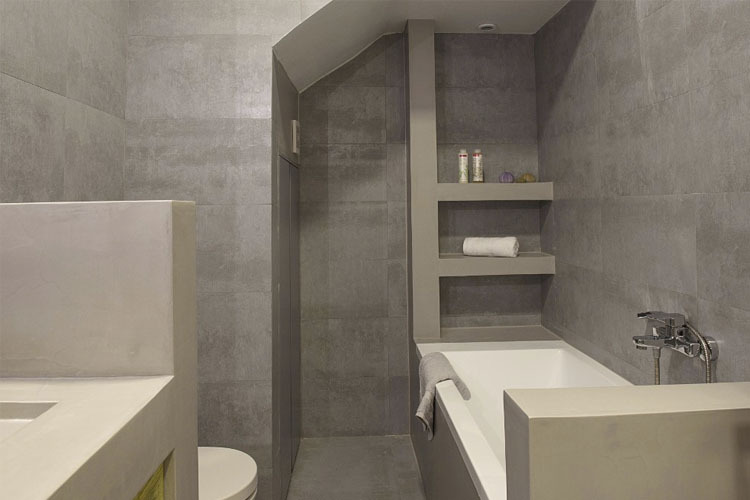 Maisonette size 60 sq m.
All maisonettes feature: mattresses, pillows, bed linen and towels by COCO-MAT, a recognized leader for natural sleep products. Bathroom toiletries are from MastihaShop, with natural mastic oil, a 100% natural product which contains an exceptionally large variety of therapeutic and aromatic constituents. Maisonettes are also fully air-conditioned, and come with complimentary Wi-Fi and flat-screen TVs.